Bill Belichick has saved some of his best defensive game-planning for the Los Angeles/St. Louis Rams. And in doing so, he’s capped the latest Super Bowl victory much like he did their first. In Super Bowl XXXVI, the Patriots showed the Rams something they hadn’t seen before. Recognizing that the “Greatest Show on Turf” went thru Marshall Faulk, the Patriots decided that they were going to hit Faulk (and hard) every time he went out of the backfield and they punished him enroute to a huge upset win. Last night, Belichick showed the Rams something they hadn’t seen the Patriots do on tape by playing a defense that was different for them and totally confusing to the Rams offensive players. It was stifling, physical and utterly brilliant. In our pregame matchups, we thought the Pats would dust off a look of the old Bears 46 Defense in an attempt to take away the Rams stretch running plays. What Belichick did was different but similar. They ran what looked a 6-1 front with both outside linebackers up on the line of scrimmage. The Rams run with a ton of motion and use play action more than anyone with QB Jared Goff under center about 40 percent of the time. But the Patriots interior defensive linemen didn’t take the cheese. Rather than sliding east-west with the motion, they were attacking north-south and penetrating the gaps. The Rams outside running game was negated by the linebackers setting the edge. Todd Gurley who does the bulk of the Rams outside running was held to just 35 yards on 10 carries. And by having the outside backers up, right on the line of scrimmage, those screens to the backs were negated. Gurley and C.J. Anderson had just three catches for 11 yards. The other thing it did was take the Rams out of their tight formation packages that they like to run where it gives its more options. By having the linebackers in their face, everything was disrupted and it was plain to see all day. Sean McVay, who after the game said he was thoroughly out-coached then had to adjust by moving their receivers farther out wide. That further hurt their zone stretch running plays and much of their crossing routes over the middle. But the second half of the defensive equation was arguably Belichick’s best move and he can thank his former Defensive Coordinator Matt Patricia for the blueprint on this one. Matty P, who was being roasted by the talking heads on the air after the game last night, must have got a huge smile on his face and a big piece of redemption because Belichick copied what Patricia’s Lions did late in the season. Harmon however, did come on to play in the second half, when Pat Chung appeared to break his arm early in the third quarter. Chung was put in an air cast and then watched the rest of the game from the Patriots sidelines. Facing a lot of third and long situations, Belichick and Flores unleashed the Ameoba fronts we’ve seen so much of down the stretch and the pass rush was outstanding. 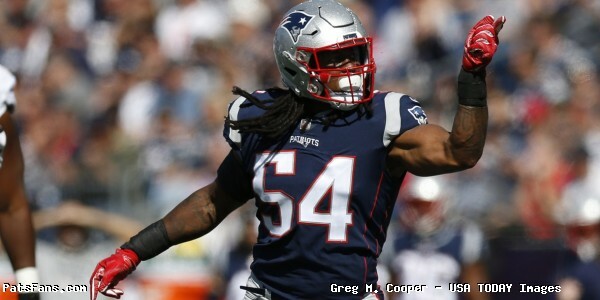 Kyle Van Noy and Dont’a Hightower were all over the field and provided outstanding pressure. Hightower had a pair of sacks, a tackle for a loss, a pass defensed and three QB hits. Van Noy was a pain in the backside for Goff as well with a sack, a tackle for loss and a pair of QB hits. For two players who are “too slow”, they certainly didn’t appear so, …especially to the Rams offensive line. The coverage was a perfect blend to the pass rush. Goff most times had absolutely nowhere to throw the ball and was hounded all night long. But it wasn’t just Goff, the entire Rams offense was out of synch and looking for answers all night long. Stephon Gilmore was once again outstanding and sealed the deal with an interception on the Patriots 2-yard line after Harmon blitzed and forced Goff into launching a floater that was a too-easy interception. The Rams had the #2 offense in terms of yards (421.1) and points (32.9) during the season. The Patriots held them to just 260 yards and three (3) points in the Super Bowl. For all the talk all season about this defense wasn’t good enough, they faced three excellent offenses in the Chargers, Chiefs, and Rams in the postseason and beat all three with outstanding efforts in each game. The Patriots defensive six-cess was another example of a brilliant coaching job by the master. 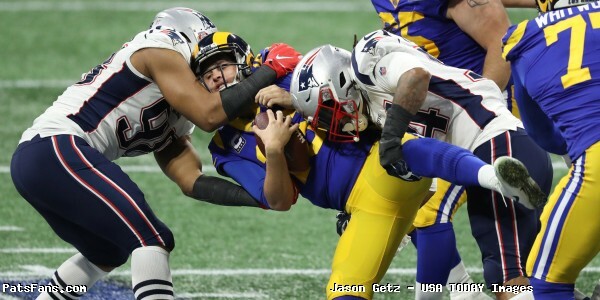 Belichick did it to the Rams again, with a tip of the hat to Matty P.
This entry was posted in 2018 Patriots playoffs, NFL Commentary, NFL News, Patriots Commentary, Patriots Film Room, Patriots News and tagged Bill Belichick, Dont'a Hightower, Duron Harmon, Jared Goff, Jonathan Jones, Kyle Van Noy, Los Angeles Rams, New England Patriots, New England Patriots Defense, New England Patriots dynasty, Pat Chung, Sean McVay, Stephon Gilmore, Super Bowl LIII, Super Bowl XXXVI on February 4, 2019 by Steve Balestrieri. In this episode, we discussed and analyzed all the teams in the AFC East. This entry was posted in Patriots News, Patriots Podcast and tagged Buffalo Bills, Miami Dolphins, New England Patriots, New England Patriots Defense, New England Patriots dynasty, New England Patriots Offense, New York Jets on July 8, 2016 by Russ Goldman. For anyone who watched the Patriots transform themselves from a perennial doormat to an NFL juggernaut, “Patriot Pride, My Life in the New England Dynasty” by Troy Brown and Mike Reiss is a must read. 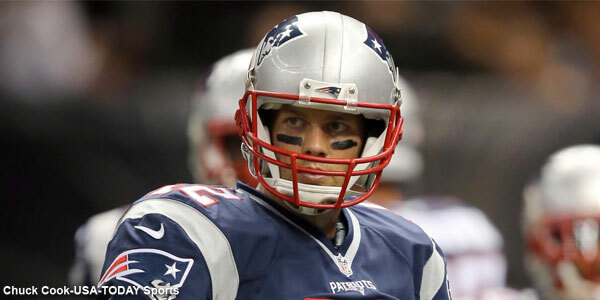 Also included is a foreward by Patriots QB and Brown’s teammate Tom Brady. Brown’s early life is chronicled in Blacksville, South Carolina where his humble beginnings shaped him and prepared him for a future NFL career that lasted 15 seasons with the New England Patriots. Brown is a shining example of a smaller player from a modest upbringing that can beat the odds and be a giant in the game played by physically much bigger men. Brown was an 8th round draft pick (they don’t have those anymore), from Marshall so today he would be considered an undrafted free agent. His phone call from Bill Parcells was brief and typically Parcells, after welcoming him to the Patriots, Parcells said, “Thanks Troy, you just save me a lot of money.” At the time UDFAs signed for considerably more than Brown’s $15,000 would so it was Parcells way of challenging him. More of that would come later. When arriving in New England in 1993, the Patriots were far from the powerful model franchise that they are today. They were nearly always at the bottom and had just hired the Super Bowl champion coach Parcells to try to turn the moribund franchise around. Brown went thru his trials and tribulations and survived being cut by Parcells to being brought back and gradually working his way not only on the roster but earning a bigger and bigger slice of playing time along the way. He and backup quarterback and now Patriots announcer Scott Zolak would hone their skills by running the scout team offense. They would frequently go off script and make plays. The scout team would have plays diagrammed to go to a certain place on every down. But instead of throwing into double and triple coverage, Zolak and Brown would improvise and Brown was productive and he opened eyes on the coaching staff. After the 1996 Super Bowl, which Brown missed with an injury, Parcells left for the Jets. Pete Carroll came to New England and the culture change was evident. Brown never felt comfortable or confident in Carroll and the team foundered. Three years later Bill Belichick arrived and everything changed. Brown had his best season in 2001 leading the NFL in punt returns and catching 101 passes for 1199 yards and five touchdowns. Under Tom Brady, the team overcame a rocky 0-2 start to beat a heavily favored Pittsburgh team in the AFC Championship game where Brown returned a punt 55 yards for a touchdown. The Steelers were so cocky that they hung a Pittsburgh conference champion t-shirt in the Patriots locker room. From there the Patriots stunned the NFL by upsetting the St. Louis Rams in Super Bowl XXXVI. Brown recalls being shocked that the team during a third Super Bowl run in 2004 asked him to play defense when injuries decimated the secondary. 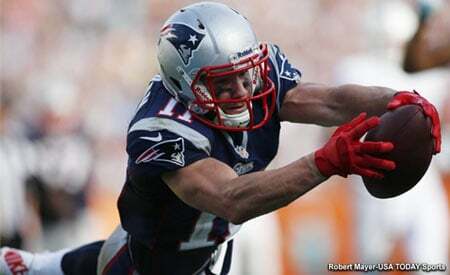 That selfless act and the fact that he played very well in the role, epitomizes the Patriots under Bill Belichick. Everyone puts personal goals behind team goals and no one showcased that more than Brown. As his career in the NFL was winding down, Brown knew it was time to retire when his body told him the time was right. Working out at Marshall in the off-season, he knew it was time and informed the Patriots he was retiring. Brown parlayed his playing career into a broadcasting one, he’s now a regular on Comcast Sports New England with their Patriots coverage and was elected to the Patriots Hall of Fame in 2012. Reiss weaves a great factual bio on one of the Patriots most beloved players on the Super Bowl winning teams. 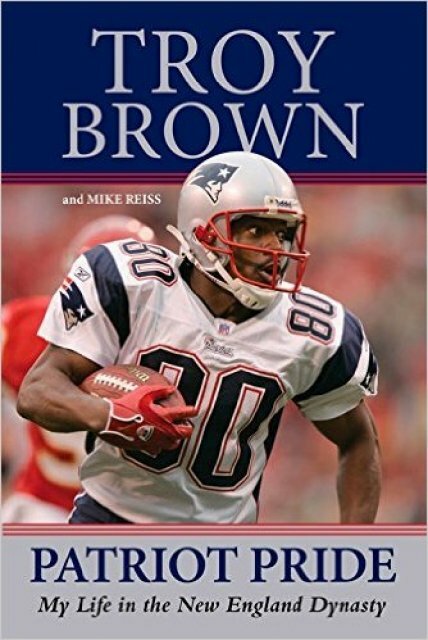 This book is a perfect gift for the Patriot fan and will one of those works that is always referred to as a ready reference to not only Troy Brown’s career but those three Super Bowl winning teams from 2001, 2003-04. It is an easy, entertaining read and one that you can’t put down. You can order it on-line thru Amazon.com or find it in your own bookseller everywhere. This entry was posted in Patriots Commentary, Patriots News and tagged Bill Belichick, Bill Parcells, Drew Bledsoe, Mike Reiss, New England Patriots, New England Patriots dynasty, NFL, Patriots, Pete Carroll, Pittsburgh Steelers, Social Media, Super Bowl XXXIX, Super Bowl XXXVI, Super Bowl XXXVIII, Tom Brady, Troy Brown, Troy Brown book on October 31, 2015 by Steve Balestrieri.